Protectant and Durable Luxury Pet Cage Cover provides the best security, comfort and privacy that dogs instinctively require. 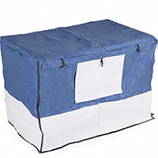 This pet cage cover is available in five different sizes (24”, 30”, 36”, 42” and 48”) and it is made up of 600D Oxford fabric with PVC coating. One of the most striking features about this dog cage cover is its water resistance.